We have ordered 10 laser cut Sky Bunny kits from the newly revived Peck Polymers. If you would like to purchase one, please let webmaster@oaklandcloudduster.org know via email. The price is $15 per kit. You can contact the new Peck Polymers at peck.polymers@gmail.com and order one directly from them. You can order through FAI Model Supply at http://www.faimodelsupply.com. You can print the plans from OCDs web site at http://www.oaklandclouddusters.org/Plans and build one from the plans. We hope that you build one and bring it out to fly on April 12, in the OCD Small Field Contest at Lagunita. 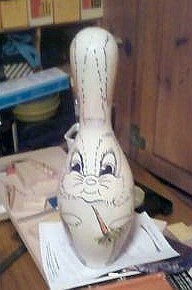 Here is the Sky Bunny event trophy you'll be fighting for, courtesy of Tom Faith.